For two days I was immersed in the world of industrial crane manufacturing at Rochester, New York. I’m in the marketing department of Acculift, so this was unusual on many fronts. As a marketing professional, I need to intimately understand our company, the products, and the services we offer our clients, but I’ll never be at the level of understanding of our service people or our sales staff. Their knowledge comes from years of hands-on experience of installs and clients meetings that I’ll never acquire. Yet, to better fulfill my role I need to understand what they do to build accurate messages in our marketing efforts. 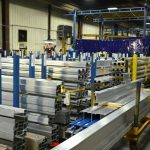 So when I had the opportunity to visit one of our key suppliers in Rochester, NY, to learn from the very makers of our products, I jumped at the chance to fill some knowledge gaps. They call it the University of Gorbel, and here’s the experience of a very office marketing person, in a very industrial world, learning the slings and wire ropes of crane manufacturing. 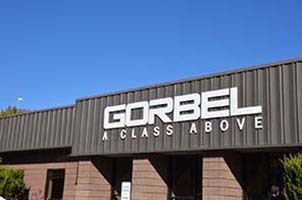 The head office and crane factories of Gorbel are nestled in a beautifully landscaped little valley in Fishers, New York, right next to Rochester, NY. With an onsite gym, cafeteria, well-designed interiors, and the latest technology in meeting and board rooms, Gorbel’s head office feels more like a university campus than an industrial facility. This area has a long manufacturing history as Kodak once had their head office and manufacturing facilities here and has the infrastructure to support world-class manufacturing. 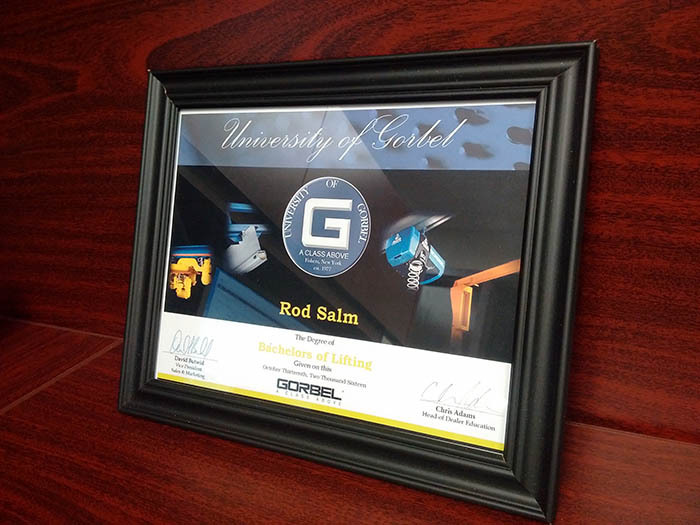 Gorbel is one of the largest employers in the area, is very much a leader and integral part of the community. Introductions are made as over 20 crane sales professionals, installers, and myself settle into our seats. We come from all over North America, from Mexico City to Winnipeg, with the majority of salespeople from Eastern United States. Today’s agenda includes a history of Gorbel, workstation crane knowledge building, G-Force demonstrations, and a tour of the facilities. John Reynolds, a fellow Canadian, is heading up presentations and is with us for the entire journey. Founded in 1977, Gorbel is a family owned business and carefully cultivates a culture of caring for individuals – customers and employees. Brian Reh is the third generation of the family to take the helm of this international manufacturer. You can read more about the history of the company here. 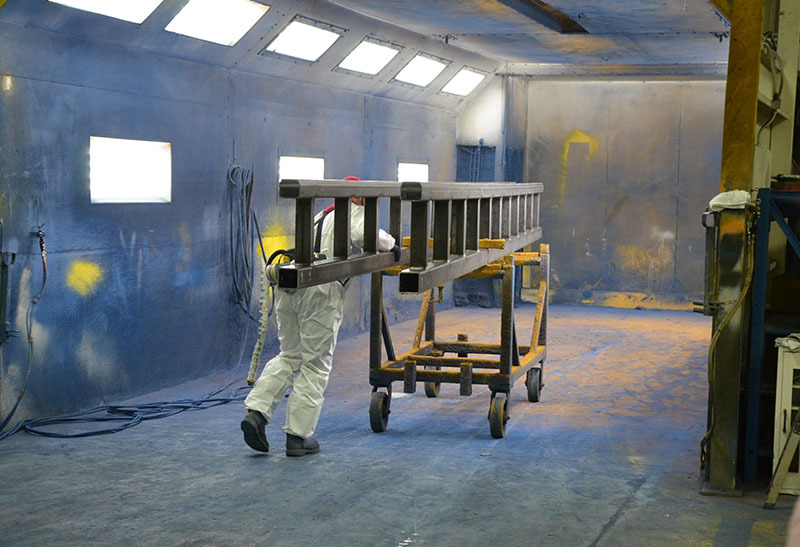 Gorbel’s main products are in industrial lifting with secondary product lines in fall arrest equipment and medical lifting equipment. 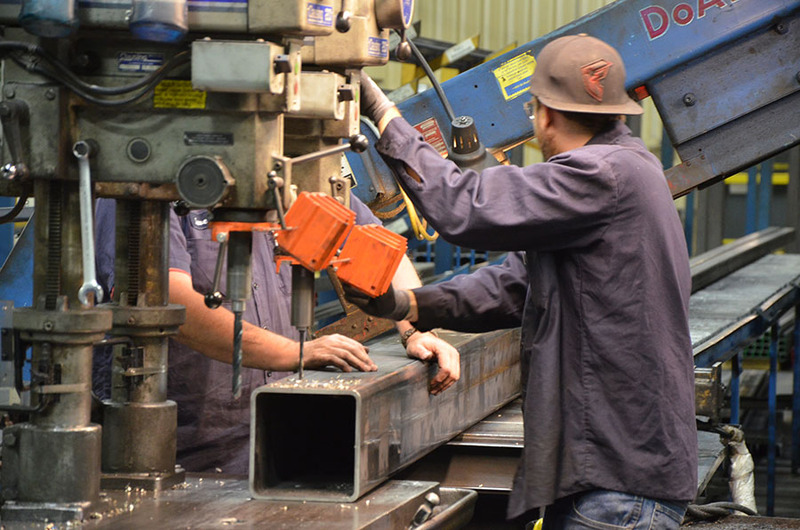 They are one of the largest overhead crane providers in North America. 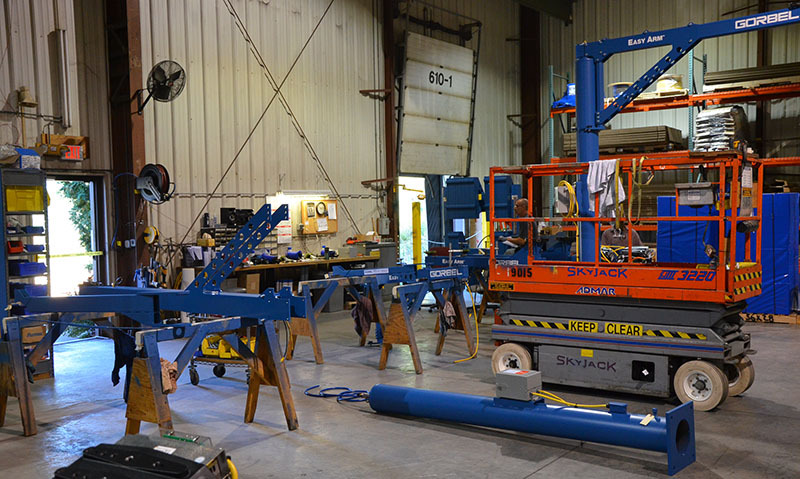 Jib cranes form a big portion of their sales so that’s where we start with our product training. Gorbel has a large selection of jib cranes, from simple wall mounted versions to heavyweight articulating freestanding jib cranes. You can read more about jib cranes here. This lesson shows us the features of each, suitable applications of each feature, points to consider when ordering for your client, and where to find more technical data. 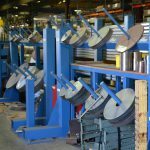 Although they have standard designs, each is custom fabricated to order so alterations, additions, and new ideas can be incorporated into every individual order. Each order is in effect, a custom build, for every customer. 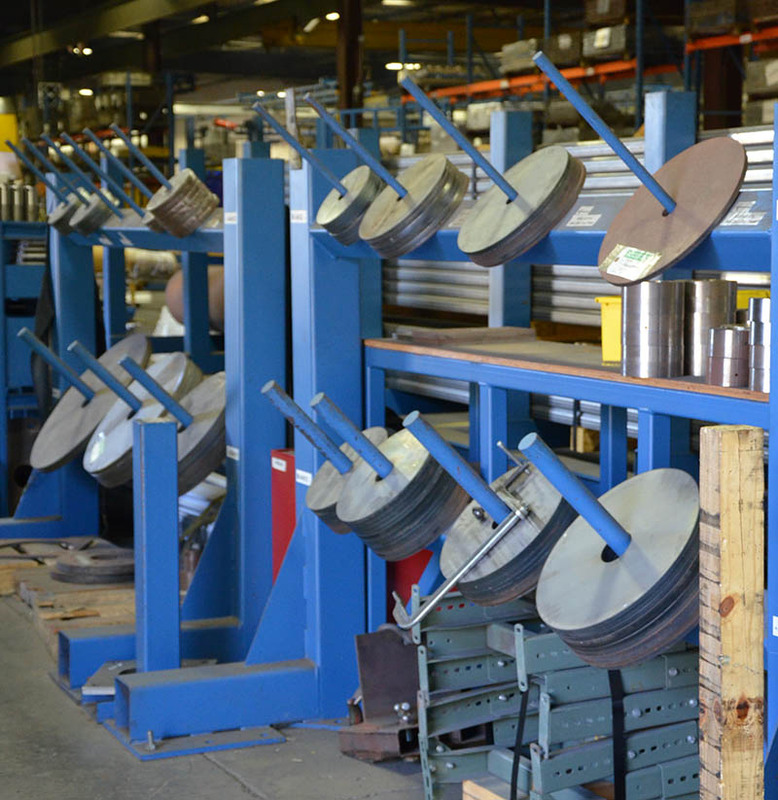 With considerations such as cantilevers, tracks, wall-mounts, freestanding options, articulation, lift weight, handling options, track selection, span coverage, rotation requirements, foundation requirements, and more, a knowledgeable salesperson will be your best friend in selecting the right options for your facility. 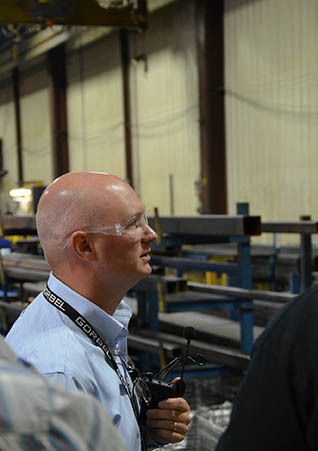 Led by Kevin Duhamel, Product Manager for Workstation Cranes, Tether Track, and Jibs, we were split into two groups and shown the main production facility. 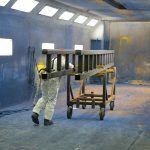 From the unloading of materials from their metal factories to production, to painting, to packaging, this massive building runs three shifts a day and is a constant stream of activity. Trucks arrive regularly to drop off raw materials while empty trucks are loaded with finished products at the other end of the building at the shipping doors. 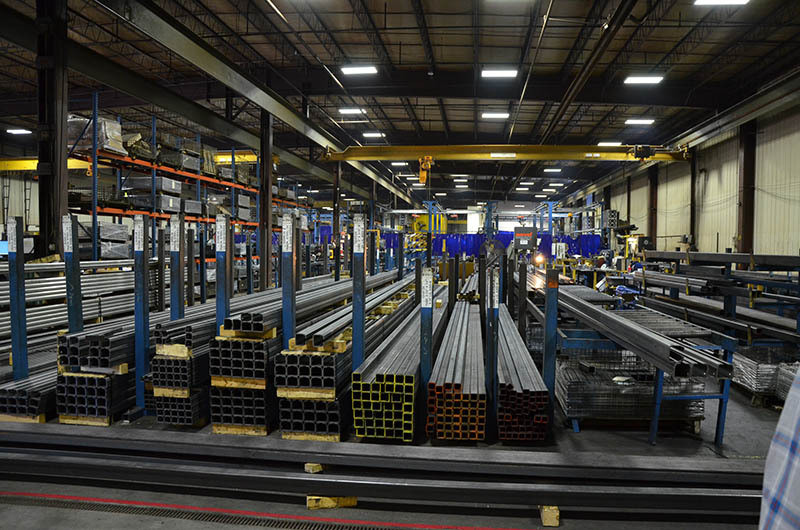 Controlling and owning their supply chain enables Gorbel to run lean and efficient production lines with the shortest order to delivery time in the industry. 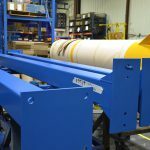 Every crane is built to order and they can ship in as little as five days after the order is placed! 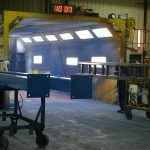 The welding bays are of particular pride to Gorbel. 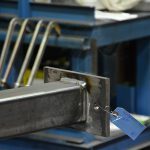 My brother is a welder, and I’m sure he would have been more impressed by the technology they use, whereas I was impressed by how quickly the welders were able to produce perfect weld joints. 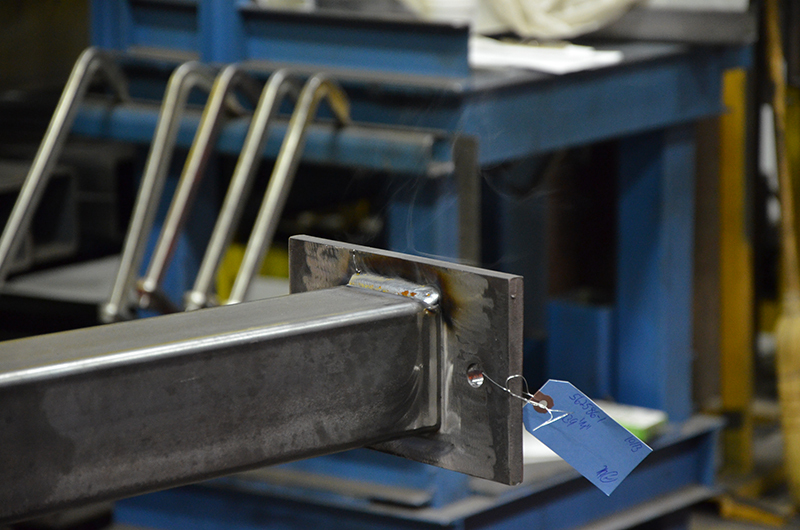 This speaks to the many years of experience the welders have and the efficiency of the operation. 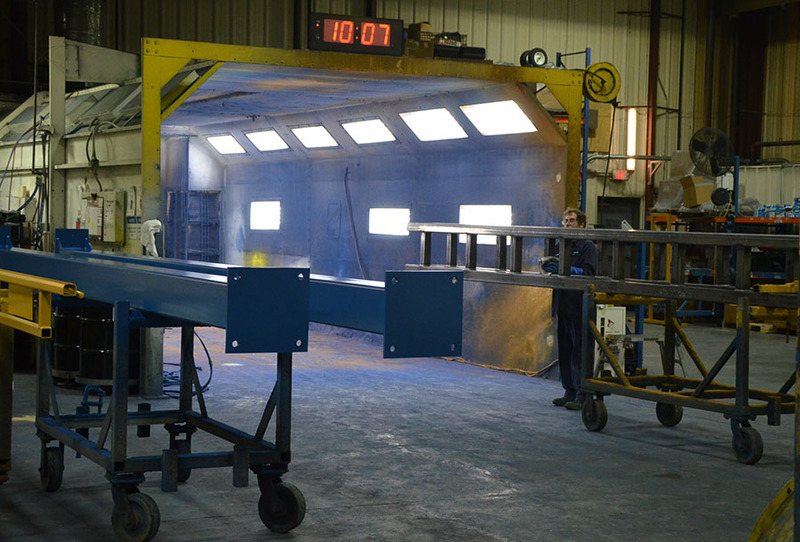 Process efficiency is also an ongoing goal for this production facility and they are continually looking for ways to streamline the operation. Close by in another building is their electrical lab. 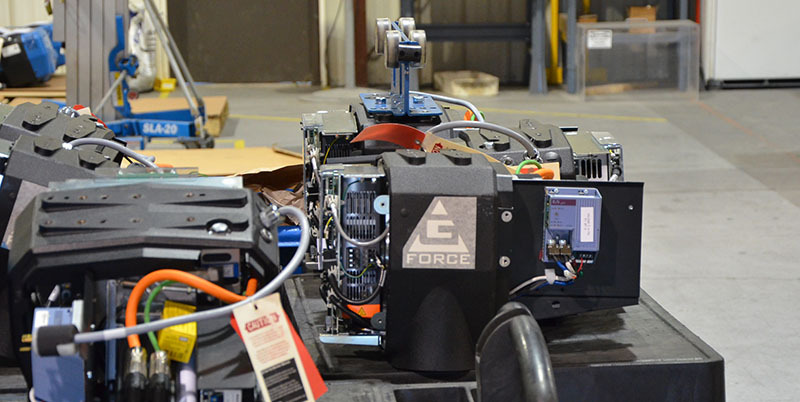 It’s here where Gorbel technicians add the electrical components to jib cranes and assemble the G-Force components. I had never seen an open G-Force unit before so I felt like I was being a bit sneaky when I saw the “naked” unassembled versions. 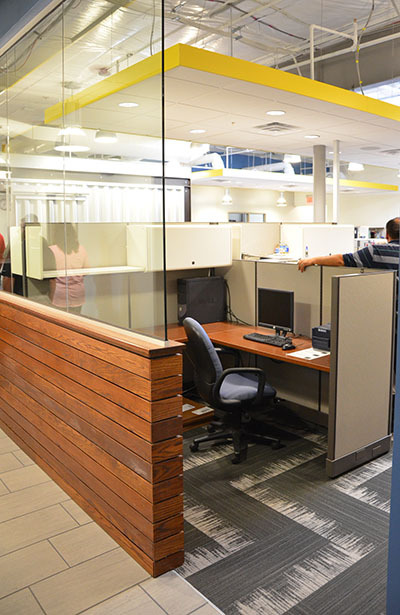 This building also houses much of their front office staff including customer support and the marketing department. At last, a place I could mingle with others of my ilk! Alas, it wasn’t to be, as the marketing department was in a meeting so we only saw their empty desks. 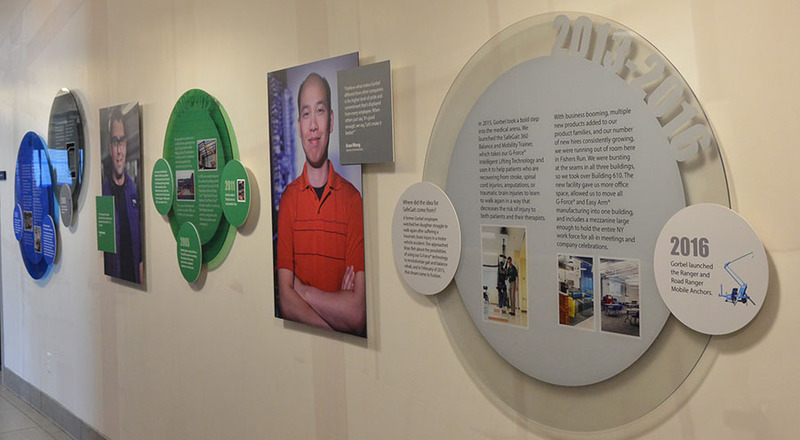 Of note, throughout all of the office wall spaces at Gorbel, were employee recognition posters and displays. 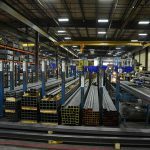 This is one of the many ways this family owned company has fostered long-term employees and a very loyal workforce. 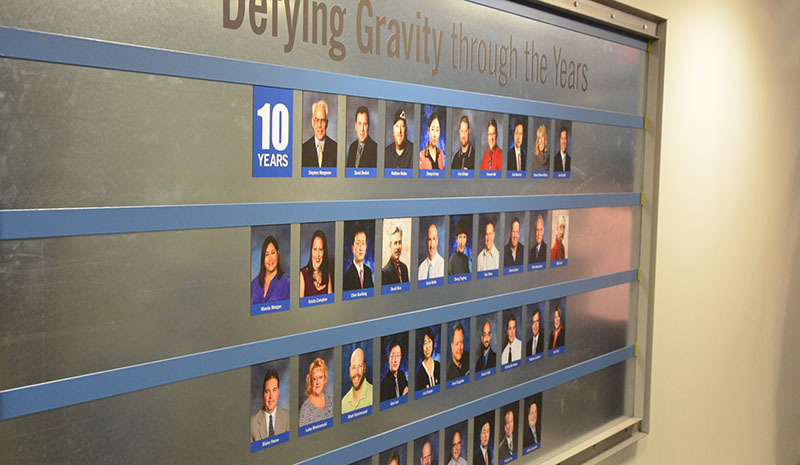 Below is a photo of a wall illustrating employees with 10 years experience, and there was another wall with more people who had been at Gorbel for 15, 20, and even 30 years! That type of dedication is earned over years of commitment to their employees and to their clients. Obviously, and rightly so, I wasn’t allowed to take photos in this area of the campus. This is where they forge product ideas for years to come and competitors would love to see what Gorbel has in development. I’m not going to speak to this area much as that’s not my place and much like R&D in the rest of the world, no one knows what or when experimental products will come to the world. Part of their growth is into medical lift assist devices. In a high-security area regulated by the FDA, Gorbel is blending their product knowledge into rehabilitation assistance devices. These devices combine track technology with G-Force intelligent lifting and their fall arrest knowledge into a new product line that aids in walking rehabilitation for stroke victims, leg injuries, athletic rehabilitation, and the like. You could feel the pride the salespeople have in this new venture as they described how it speeds up the healing process and the benefits to therapists who work with rehabilitation clients. They did reveal to us the newly minted Road Ranger – the roadworthy companion to the Ranger Mobile Anchor fall arrest device. 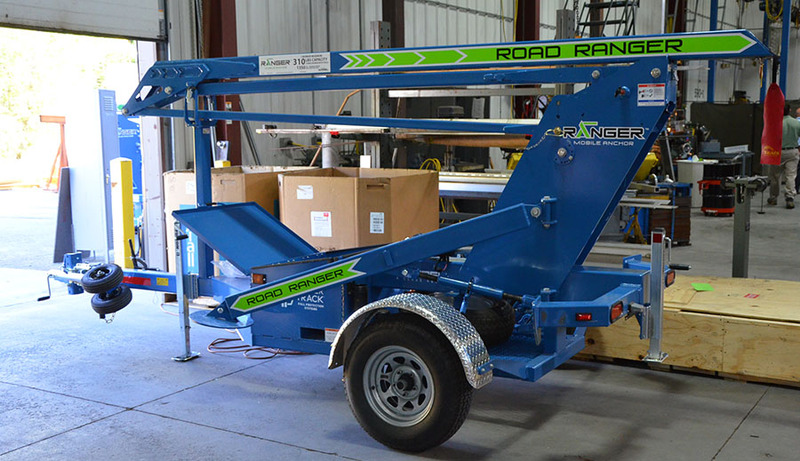 This version is DOT ready for high-speed freeway towing (other iterations of the Ranger are meant for towing around work sites and needed to be on a flatbed to transport long distances). G-Force training and orientation filled some time of the first afternoon for us. I was pretty familiar with this ergonomic intelligent handling device as we had filmed a features video of it as we have a demo unit in our own showroom. Still, watching an experienced handler operate it I learned quite a bit more – such as the how the G-Force 360 component provides quick-swap capability of end effectors and how it can rotate 360 degrees while still providing electricity to the unit. Very great somewhat hidden features of the G-Force. Easy uncoupling allows for quick swapping of end effectors in the G-Force. Gorbel staff demonstrating the G-Force unit with a custom below the hook device for lifting automotive equipment. First thing after our hearty breakfast, we break into teams and are tasked with assembling an overhead crane. Actually, “overhead” is a bit of a stretch as this crane is purpose built for demonstrations like this and is only about two meters tall. 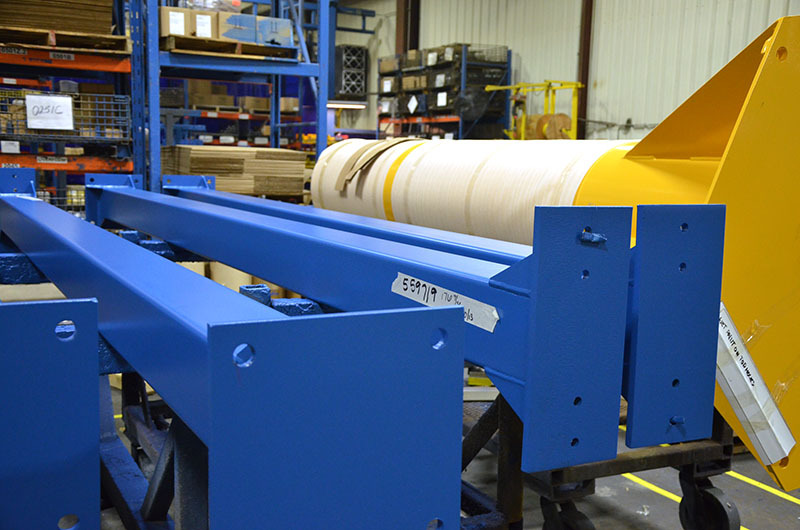 This allows quicker assembly without the need for a scissor lift or forklift while still working with all the same components. This was probably the most valuable exercise for myself as I now have a better understanding of the assembly process of workstation cranes. It has certainly raised my admiration for our crew and the work they do and how well they do it. 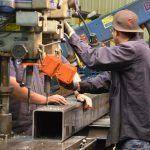 While Gorbel has done it’s best to make assembly as easy as possible skilled install people are still the biggest asset a company like Acculift has in the field and for our customers. As our team checked the parts listings, we noticed a problem with missing parts. So, as in real life, we called up Gorbel friendly support team for assistance (or in this case, asked our sales rep who was watching over us, what was up with that). 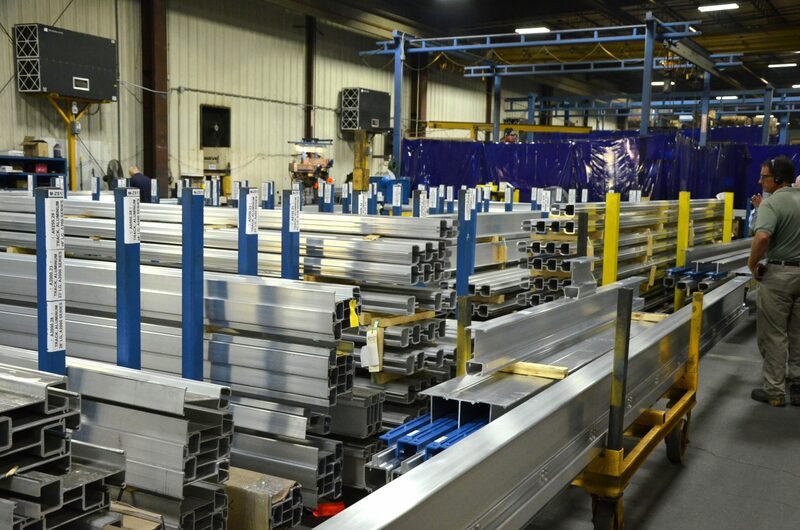 Our fault, we didn’t read the labels closely enough – we found our parts and were ready to start on the assembly. Luckily for our team, we had an experienced installer on our team who walked us through most of it – the other team wasn’t as lucky. We were completely assembled, plumb, and tightened down within the hour. Assembling the bridges to the columns to the rails to the track with trolleys was a little dizzying for this newbie but not so to the salespeople and technicians I had on my team. 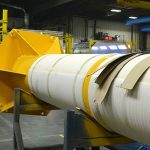 Keep in mind, these smaller crane kits are for assembly demonstration purposes, and are not the full sized, full height versions our installers typically work with on a daily basis. As we dropped washers and the occasional tool, I was ever mindful that the Acculift team does assemblies like this, at heights, with full weight crane systems, on varying location, incredibly fast. Newfound respect for our team as I was struggling just to remember the names of the parts and how the finished crane should look! Simplicity in design only happens after many, many, years of development of individual components. Which had me asking why are we assembling a crane before they’ve even shown us the names of the components? Gorbel purposefully does this for what is their beginners crane training course. Having to assemble a crane BEFORE the orientation session on overhead cranes gives sales people a better understanding at the theory stage. They can understand the components they are speaking of, how they come together to make better selections at the design level, and retain more knowledge from the in-class portion of the training. This course is designed to make you very familiar with the products and focuses on the benefits and sales information, not to turn attendees into a service technician. Service techs start with this course and go on to other more detailed training. Having a little bit of hands-on experience, in the classroom we learned the various software tools Gorbel has built to help salespeople select the perfect lifting solution, get accurate quotes, and plan out delivery times. One thing Gorbel does very well is to mix up presenters and activities to keep the tempo of the learning up. The passion and energy of the staff definitely shows through with in-depth knowledge, playful banter, and a commitment to helping everyone to truly understand the Gorbel promise. I had to leave a little early than others to make my flight back to Winnipeg from Toronto, but before I could sneak away, our sales rep, John Reynolds, presented me with my “Bachelors of Lifting” certificate in front of the class. Secretly I think he was glad to have another Canadian in the classroom throughout his presentations, even if it was just a marketing person. Signed by David Butwid, Director of Sales and Marketing, and Chris Adams, Head of Dealer Education, this certificate is a testimony to their dedication to having knowledgeable people selling their product. Sitting on my desk the certificate displays my understanding of the lifting industry and also highight’s Acculift’s commitment to providing the best possible service to all it’s clients at every touch point with them.